We’re very pleased to say that MagAid has taken another step forward this year. Our partnership with the National Literacy Trust, where MagAid projects are delivered under as part of the Young Readers Programme, has been expanded further across Britain. We are in discussion with our colleagues at the NLT about developing MagAid further for 2017, with updates now provided via the PPA website. Finally, we would like to say our now annual ‘Thank You’ from everyone involved in MagAid to Anne Jordan and the team at Signature Publishing, who will again be making a donation to the charity in lieu of sending Christmas cards. It is a really kind gesture and we are very grateful to Signature for their support of this important cause – one which we know is close to their heart as a company. Here’s to another successful year in 2017! Despite the inexcusable 12-month gap in blog entries, plenty has been going on behind the scenes with MagAid in 2014. So, falling in line with the seasonal trend for round-ups and reviews, here’s an overview of what happened this year and a look ahead to what’s coming in 2015 (part of which will be to keep this blog updated on a much more regular basis, we promise!). Our special thanks go to Peter Houston of the Flipping Pages blog, the man behind one of the most interesting and, from a MagAid perspective, important initiatives of 2014: The Magazine Diaries. Over three months, Peter coaxed and cajoled more than 100 magazine professionals to take the time to write 100 words on how they felt about what they do for a living and the products they make – and every penny of the £5 cover price will go to MagAid. If you haven’t already, buy your copy here. We were amazed again at the generosity of the publishers who contributed to donations at The PPA Awards, the Independent Publisher Awards and the Scottish Magazine Awards this year. All of this money will be invested into MagAid projects in the New Year so thank you to everyone who donated. In what is becoming a bit of an annual tradition, Signature Publishing have again decided to make a donation to MagAid in lieu of sending Christmas cards. Signature has been a core supporter of MagAid from day one and we are very grateful to Anne Jordan and the team for continuing their valued support. Given all the effort that goes into all the fundraising mentioned above, we are very pleased to be able to announce that four new MagAid projects will be kicking off in the New Year. 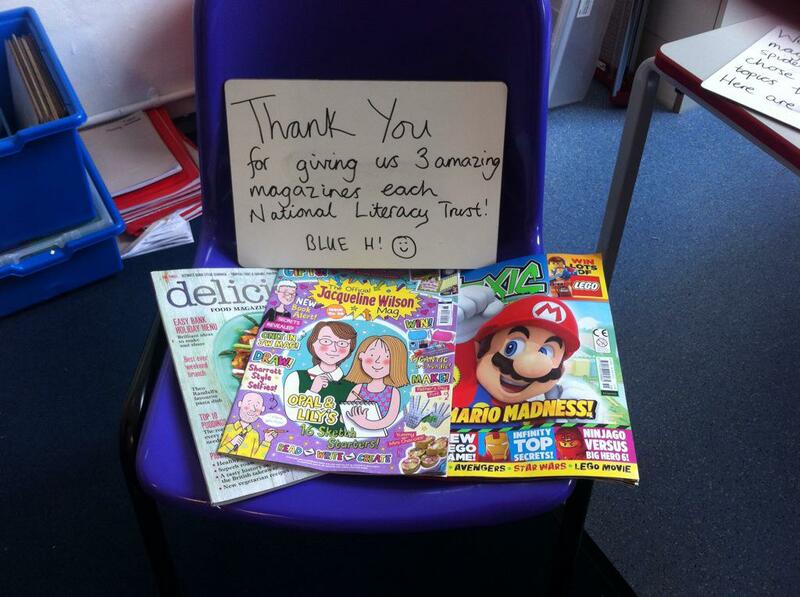 These projects are the result of a lot of planning behind the scenes with the National Literacy Trust this year. Based on the results of the second pilot projects, we have made some revisions to the programme that will enable us to reach a greater number of children in the schools involved. We’ll share more details on this as the projects develop and, as ever, if you are interested in getting involved in MagAid then please email us. The MagAid coffers were swelled by over £1,000 on Friday, 6 December at the 2013 PPA Independent Publisher Awards at The Montcalm hotel in London. Thanks to all the guests at the lunch event for their kind donations – and congratulations also to those lucky enough to walk off with one of the fantastic raffle prizes! All the money raised will be set aside for investment into the next phase of MagAid as we build on the momentum from our successful second round of pilot projects which took place this year. If you’re a PPA member, or if you work in magazine publishing and want to get involved, get in touch by emailing magaid@ppa.co.uk.